IOTA is the UK distributor for Swiss Pearl, whose contemporary outdoor and modern garden furniture showcases the best in European designer garden furniture. Made in Switzerland from strong, lightweight FRC (fibre reinforced cement), it is minimalist, sculptural, and ergonomically designed for optimal comfort. 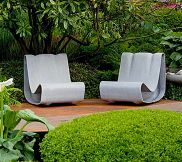 A great choice for contemporary relaxed seating in a garden, on a patio or terrace.